Students may remember the practice “SBAC” testing they have been taking every Friday for the past few weeks. Some may have questioned the purpose of these tests but now should be eager to see what will arise from their weeks of preparation. Beginning April 1st Juniors will be participating in the CAASPP testing, which started back in 2015. Juniors will test in three different areas (math, English, and science), and will spend Mondays and Tuesdays of the next three weeks providing answers. CAASPP testing is based on the accumulated knowledge obtained from grades 8 through 11. The test will not affect one’s grades or GPA, or graduation, but should be taken with very severely. For this, Weston Ranch is providing incentives as rewards for those students who score well on the tests. For those invested in attending a 4-year university after high school, the test will have more weight on their college application than one would expect. The final score one is placed permanently on their transcript for all universities to see and will affect their placement in classes for any school (Junior colleges included), thus creating the demand for taking the test with a high degree of seriousness and integrity. CAASPP results will not be the only ones affected by their test scores, however. The high school will be placed on a national, state, and district ranking afterward and will put on display the total measure of the school’s performance in academics. As a byproduct of student achievement, overall student performance may also affect how subjects may be taught in the future and what teachers will need to have to improve instruction. In order to help the students do their best on the test, the school is offering small incentives based on the individual score one receives. 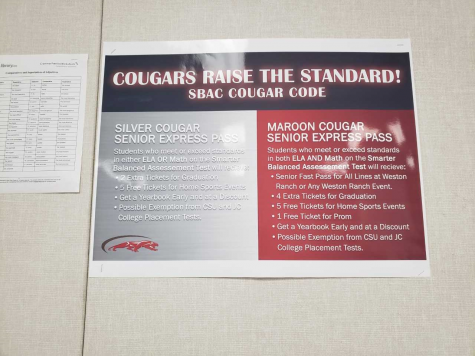 Depending on the score, a student will receive either a “maroon” or “silver” card which both contains different rewards. The list of incentives has been placed in every classroom throughout the school and can also be viewed in the picture attached in the article. Students should expect to receive their scores in June and be very eager to begin testing next week. Good luck Cougars!